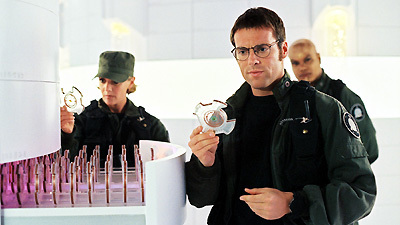 The Enkarans had been captured from their homeworld and enslaved by the Goa'uld long ago, but thanks to SG-1, the race has been transplanted to a new planet. P5S-381 is a new and safer world, unique in that it provides precisely the environmental conditions and protection from radiation that the Enkaran physiology requires. However, as the Enkarans prepare to celebrate the rebirth of their civilization on their new homeworld, a mysterious ship appears on the horizon and begins to systematically destroy the landscape. SG-1 investigates, and meets Lotan, a bio-mechanical liaison created by the ship, who explains that the ship has no hostile intent. The ship belongs to the Gadmeer, an advanced but long dormant alien species which had been conquered by a powerful enemy and which only seeks a new world. The Gadmeer physiology is based on sulfur, and the ship is merely terraforming the planet. Once the process has begun, it must be completed, or the Gadmeer will face extinction. However, the Enkarans cannot be relocated in time, and to stay would mean their own certain death. Faced with choosing extinction for an entire race, SG-1 must struggle with an ethical dilemma. O'Neill makes the difficult decision to destroy the ship, and orders Carter to program a naquadah bomb. Before his plan can be completed, however, Lotan diverts the bomb, then makes a promising discovery. The ship's computers locate the original Enkaran homeworld, long since forgotten, and Lotan offers a compromise. If the ship transports the Enkarans to their ancestral home before the terraforming is complete, both races will have a chance to survive. There is no stargate on the Enkaran homeworld. The Goa'uld kidnapped the Enkaran ancestors by ship to a new world. When faced with disaster on this world, they were transported by the SGC to build hundreds of villages on P5S-381. The Enkarans require a dense ozone layer to protect against radiation since even low levels of radiation can cause blindness and death. The Gadmeer, whose physiology is based on sulfur, were an advanced and peaceful race who fell victim to a superior military power. They placed their legacy, all their knowledge from 10,000 years of civilization, into the ship, looking for a new home world to colonize. The alien ship terraforms the planet by destroying all native organisms and replacing them with microbes which bond with the sulfur leached out of the soil and release sulfur dioxide as they decay, thus creating an environment to support an organic system based on sulfur rather than carbon. The ship is 2 miles in diameter and the curtain of energy stretches over 20 miles. Once the terraforming process has begun, it must be completed. Lotan is a bio-mechanical representation of the Enkarans, assembled to facilitate communication between the Gadmeer ship and the Enkarans. SG-5, 6, and 9 are looking for suitable alternative homeworlds. If a feedback loop is created within a naquadah reactor, it will build up energy rather than releasing it and create a powerful bomb.